Fabrication of an Active Air Suspension System is a final year Mechanical project. Air ride suspension carries the load on each axle with a pressurized air bag just as a high pressure balloon. This system provides the smoothest and most shock free ride of any of the known vehicle suspension system. An air suspension includes a multiple air spring assemblies that each includes a piston airbag and a primary airbag mounted over the piston airbag. The primary and piston airbags each have a variable volume that is controlled independently of the other for active suspension control. You can also Subscribe to FINAL YEAR PROJECT'S by Email for more such projects and seminar. 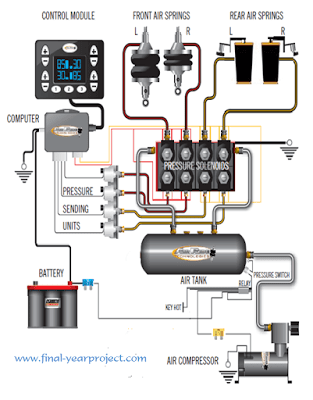 The active air suspension system is an air-controlled, micro-processor controlled suspension system. The system replaces the conventional coil spring suspension and provides automatic front and rear load levelling. The four air springs, made of rubber and plastic, support the vehicle load at the front and rear wheels. This technology allows car producers to achieve a greater degree of ride quality and car handling by keeping the tires perpendicular to the road in corners, allowing better traction and control. An on-board computer detects body movement from sensors throughout the vehicle and, using data calculated by opportune control techniques, controls the action of the active and semi-active suspensions. Active air suspension system consists of an air tank, 4-way air valve assembly (pressure solenoids), air compressors, the necessary pressure sensors, all wiring and air fittings, and an in-car electronic control module. In order to understand the working of active air suspension system, we need to understand functions of each component. The report contains full explanation of active air suspension and its construction. Use it for your reference and study work.